Welcome to Davie Dog House! At the Animal Hospital of East Davie, we (my staff and I) have been boarding dogs and cats, and grooming since January 2004. After 10 years of growth, we decided to expand our boarding facility and make some “upgrades” to provide a clean, safe, and pleasant area to keep your pet while you are gone away from home. We have collected information from the current trends in daycare and dog boarding, and also health and safety information from the veterinary world in order to build a completely wonderful experience for your pets. First, we have made a new lobby at the lower end of the parking lot just for boarding, day care and grooming pets. The lobby hours are posted, and are very similar to the hospital hours. Anytime the Davie Dog House lobby is closed and the hospital is open, you can use the hospital lobby to admit your pet. We have added Sunday hours from 4:00pm - 5:30pm to pick up AND drop off new boarders if needed. We have always strived for and will continue to insist upon a clean and healthy experience for your pets. We have strict requirements for vaccination and annual health exams for every dog and cat that stays here. We also have a wonderful new cat playroom and boarding area. This room has a window ledge to see outside, a fish aquarium, and 5 hand built cat condos for your kitty to crawl into or climb on! We also installed a webcam for the entire room that is included with your cat boarding fee. All cats will get hours of playtime daily. 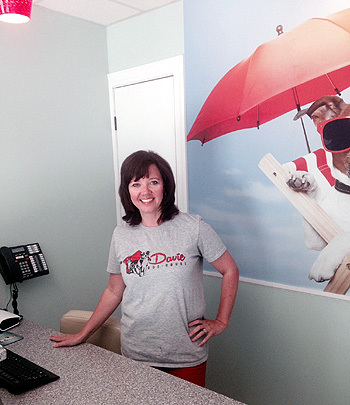 Leigh Sherrill, one of our technicians, is managing the Davie Dog House for us. Leigh, along with all our receptionists, and our eight dedicated kennel staff members will be taking care of your pets while they are here, including doing their playtimes. Please let her know how we are doing! Your satisfaction and the happiness of your pets are our highest priority!